Well appointed clubhouse with changing rooms, bar, restaurant, lounge and pro shop. Golf facilities include practice areas and equipment hire. 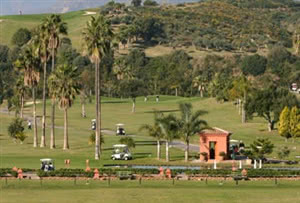 Santa Clara Golf Club, set just of the main coast road next to Marbella Hospital, is beautifully maintained parkland course designed by Enrique Canales. Opened in 2001 the course has wide fairways and little rough but the long par 3s and challenging drives over water hazards add serious challenge to golfers of all ability. Santa Clara's other claim to fame is that it has the only entirely female team of caddy masters on the coast.